The Little Giant® 10-Frame Medium Super (Honey Super) with Frames is pre-assembled for easy set up and use, including pre-installed wax-coated, natural-colored plastic foundation preferable for honey harvesting. 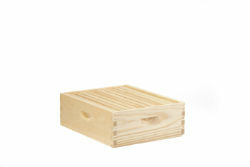 Made of unfinished pine, the Medium Super is precision-milled interlocking box joints for maximum strength. The Medium Super includes: 10-frame 6.625-inch medium super, 6.25-inch wooden frames with wax-coated, natural-colored plastic foundation.